Ranked 2019 kicks off with a new look and a few upgrades. New tiers, new visuals, and new rewards join your pursuit to the top. The competitive season begins on January 24. Here’s everything you need to know. This year you’ll get a provisional rank after your first placement game. Your provisional rank shows where you’ll start the climb and updates after each placement game. Provisional ranks are only visible to you until you complete placements. You can’t lose LP during placements, so your provisional rank can only go up. Wins earn accelerated LP and you skip through promos. After ten placement games you’ll get a starting rank. New accounts get seeded at the bottom of the ladder with a fresh opportunity to climb. There are three splits this season. Over the course of a split, you’ll earn Split Points for wins to unlock split-specific rewards to show off your rank in and out of game. Split Points reset after each split. There’s no break between splits, and playing games over multiple splits increases your rewards. Splits will last about three months each, the first ending in mid-April. Ranked Armor evolves to reflect your current rank and achievements earned through Split Points. Split Points upgrade your armor, so even if you’re 100+ games in Silver IV, your wins shine sterling. End-of-season rewards aren’t affected by Split Points, and you can still expect to sell your soul for a Victorious Skin. Position ranks are live in Korea and North America only for the first Ranked split. Position ranks give you a rank and matchmaking rating per position. With different ratings for each position, you won’t be punished if you get autofilled or branch out from your one-trick Draven to show Riven some love top. Crushing it one position can help you make gains across all of them. After each game, LP splashes into the other positions you’ve completed placements for, reflecting your overarching performance. Loss streaks cause negative LP splashing, so even in an off-position, playing to win matters. 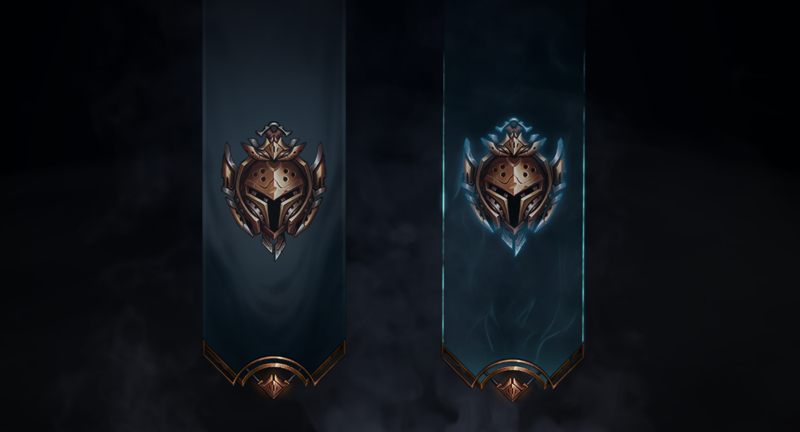 Following the preview in Split 1, every region will have the same Ranked system. We’re tracking both position ranks and single ranks globally to make the swap at the start of Split 2. Watch our devs go deeper on position ranks and the position ranks preview. This season welcomes two new tiers, Iron and Grandmaster. Every tier now has four divisions. With fewer divisions and more tiers, your rank more accurately reflects your skill and improvement. The first new tier, Iron, starts below Bronze. The second new tier, Grandmaster, sits between Master and Challenger. GG Bronze 5. We want reaching Master+ to feel like a super meaningful achievement. But the huge difference in number of players per region meant the accomplishment wasn’t universally comparable. We’ve adjusted Master+ to equalize this difference so top players across regions can play in tiers matching their skill level. You’ll see larger or smaller groups of Master+ players by region. Upgraded visuals now boldly point out when you are promoting and demoting in Master and above. Players in regions with position ranks will have a single rank in Master and above. ← Prev news: New free champion rotation: Miss Fortune, Braum, Vi and more!